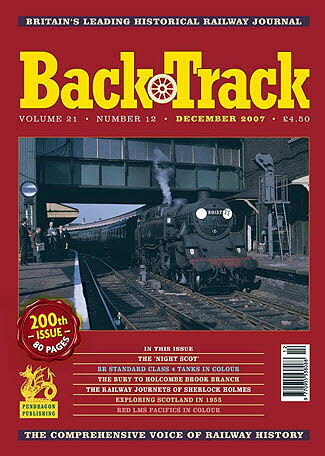 Back Track December 2007 journal from Pendragon Publishing. Around Woodford Halse - colour photos by Tommy Tomalin around this Great Central junction. A Scottish Odyssey - Stephen Bragg recalls an exploration of the main lines and branches of Scotland in 1955. The Railway Journeys of Sherlock Holmes - Nigel Digby investigates the travels of Conon Doyle's great detective, with the aid of Bradshaw's Railway Guide. Railways and the Epsom Races - Part Two of Jeffrey Wells's survey of train services to this famous Surrey racecourse. The Night Scot - Peter Tatlow looks at the timetables and formations of the overnight trains between London and Scotland. Custom House - Allan Patterson looks back on working an East London signal box. The Standard Class 4 Tanks - four pages of colour on the BR 2-6-4Ts. Through the Malvern Hills - colour pictures of diesel traction on the Worcester to Hereford line. Good and Faithful Servant - The last part of Michael Rutherford's survey of the British 0-6-0 locomotive. When Pacifics were red - colour photos of the 'Princess Royal' and 'Coronation' 4-6-2s in BR red livery. Lost behind the Rooftops - Part One of Robert Emblin's description of the building of the GC main line between Nottingham Victoria and the River Trent. 200 Not Out! - some colour photos of the first of the BR 'D200' Type 4 diesel-electrics. The Holcombe Brook branch - Michael Blakemore tells the story of a Lancashire & Yorkshire Railway branch from Bury which played a part in the early development of electric traction. The 'Silver Princess'Â - photos of an experimental stainless steel carriage imported from the USA.